The first time I got a tiger to sit up on cue took five or six weeks. Admittedly, I didn't work on it every day. If I had, perhaps it would have only taken me a couple of weeks. Later on, I learned how to get a pretty reliable sit-up on cue in a a few days. The sit-up is pretty standard fare for training circus cats—especially tigers. There are two reasons for this. One reason that sit-ups are "standard" tricks is that it is something lions and tigers do anyway. The trick is getting them to do it on cue and with good posture. Another reason a sit-up is common is that many other performance behaviors are based on the sit-up. A sit-up aligned with other big cats doing a sit-up is an impressive—and therefore commonly performed—part of a circus cat act. A sit-up on a pyramid structure alongside other cats is another standard performance device. Perhaps most impressive in terms of aesthetics is the sit-up atop a large, revolving mirrored ball. Here's a wonderful example of the mirrored-ball sit-up originally trained and performed by the amazing Charly Baumann and later refined by Gunther Gebel-Williams and Wade Burck. This trick (which you must see live to fully appreciate) cannot be performed unless you have a tiger who can sit-up and hold their position confidently while their seat rotates for a minute or so. This is an advanced skill that is built upon a basic skill. I've seen some large acts that include several lions or tigers that only have two tricks in their repertoire: sitting on their assigned seat and doing a sit-up one or more times during the performance. But sometimes that sit-up is an advanced sit-up. The thing about the sit-up behavior is that it's part of the "core curriculum" in training circus cats. But like any commonly expected outcomes, sometimes it's an easy goal to achieve and sometimes it's not. It depends. One factor involves the native abilities the tiger or lion brings to the lesson. Tigers do sit-ups frequently as part of their natural behavior, so most of them are ready to learn how to do it on cue. Lions are slightly less prone to do a sit-up naturally and also come with a physical limitation that requires some accommodation—a really thick tail base that can get in the way when trying to sit upright. You sometimes have to take more time with lions—perhaps altering the surface a bit and providing soothing reassurance—to get them comfortable with a sit-up on cue. A standard sit-up may take more time and effort with an easily-annoyed lion than with an eager tiger. But the outcome is the same. Another factor is the level of experience and expertise the trainer brings to the lesson. As I stated earlier, after a while, you can get success in training a sit-up more efficiently than when you first started. You've experimented with what works best for different individual cats—and you've seen all kinds of cats by then. The very best of those highly skilled trainers who can "teach any cat a sit-up" are those who have not let failures stop them. Instead, they persist in trying out new (or old) techniques that may work better with certain animals. They have accumulated more tools in their toolbox. What can we use from this in our teaching? There are some basic learning outcomes that are considered to essential. We'll call them "core outcomes." The core outcomes must be mastered before any advanced outcomes are possible. Sometimes core outcomes can be easily achieved, sometimes not. Some learners are ready—they have existing abilities—to learn a core outcome quickly. Some learners come with challenges that must be addressed as they master a core outcome. Learners who take more time and effort—and perhaps some accommodations in how lessons are taught—can often still achieve the same outcomes as other learners. Teachers can become more effective as they are exposed to more teaching experiences with more students. Teachers who persist when confronted with failure often evolve into expert educators. Experienced teachers often have more tools in their toolbox from which to choose when dealing with particular students or teaching challenges. Today was the first day of classes for my youngest son, who is very excited to start fourth grade. He's already met his teacher and a couple of days ago, we all went to his classroom where he found his assigned seat and got himself all set up with his school supplies. His teacher went over a couple of things regarding what to expect when you start fourth grade in her classroom. This is important. Whether you're starting a new fourth grade class or a new semester in college, making your students comfortable on the first day is important. They need to know how to find their seat and know that they'll be okay there. And they need to know what fun they'll have in the classroom. Most lions and tigers in a circus act go through the same process. First, a lion is coaxed into the arena. They feel safe in their dens and don't really want to go out and explore. I know we think they just can't wait to escape, but they're usually terrified of getting out of their safe haven. If the lion doesn't have a good time during their first time in the arena, it will be hard to get them to go back. Luckily, they've already met the teacher. He or she is the one who has been feeding them, caring for them, spending time with them, and talking to them. The next thing is show the lion his seat. That's the pedestal assigned to him (and only him). Just like in fourth grade. It's a "home away from home" in this new place. For lions, we coax them up onto the seat. A gentle nudge, some soothing verbal coaxing, a tidbit of meat . . . and the lion is on his seat. We say "Seat!" or "Platz! [place!]" or something like that. So that the lion gets conditioned to the signal to go to his assigned seat. Then we coax the lion down from his seat. Partly so we can then say, "Seat!" and get him back onto his pedestal. Such repetition is needed for learning, right? But it's partly to get him out exploring his new "classroom." Just like on fourth-grade back-to-school night when my son and all his classmates were excitedly exploring their new classroom. Thus, a lion gets comfortable with the arena--both the parts that belong to him and the parts that are shared. It's also a good opportunity to see what the lion likes to do when he plays. Is he scared of that big barrel or does he try to get it to roll? Does he like climbing on props or does he prefer slinking under them? Does he instead seem to like jumping over them? This knowledge will be used by the lion tamer to figure out what kind of things each lion will excel at, or at least how to get him interested in learning new behaviors. Also, we learn what things the lion is kinda scared of. So we can be more careful with those things that might cause some initial fear. Likewise, a teacher can get to know a lot about the strengths and weaknesses of new students by chatting with them as they explore their new classroom. When called back to "Seat!" the lion also learns which behaviors are acceptable while seated and which are not. Turning around is not good. The lion tamer needs the attention of each animal pretty much all the time. Also, turning around to face the audience could be frightening to the circus patrons! Laying down and snoozing (a favorite pastime of lions): also not good. Jumping down from the pedestal without being called down by the tamer: really bad. Distracting the other cats: not acceptable. Another crucial element during a lion's first experience in the arena is how to get out quickly, safely, and comfortably. Usually, the command is something like, "Go home!" or "House!" or something along those lines. Usually, it's accompanied by the additional cue of the exit door rattling. This is important. Not only to get everyone out in an orderly way. But if something bad happens, like a fight or attack or a fire, then all the remaining cats can be evacuated before they get hurt. So what are some practical applications of these ideas? Consider these practices to help your students get comfortable right away? Be conscious of the fact that nearly all of your students will first enter your course with some hesitation. So making an effort to be particularly soothing and welcoming can be very effective. At the first opportunity, encourage students to roam around and explore. For example, in my biology courses I want students to play with the models and specimens. Chat informally with students before the first class and get to what they're excited about and what they're afraid of. The first thing I do, is break my students into small groups and ask them to generate a list of questions they have about my course. Then I give them the syllabus and let them explore that and try to find their answers. While this is going on, I'm strolling around and informally chatting with them. Consider meeting your students ahead of time. That way, they're already comfortable before the first day. Try getting word out that you want students to drop and introduce themselves before the first class. Try hosting an "open house" in your classroom before classes start. Post some information about yourself online (your faculty webpage, for example). You might consider assigned seats, at least to start out. What's your policy on asking/discussing during class? Interrupting or distracting other learners? Teach them about exiting safely. Be courteous and don't loiter in the doorway as classes change. Where to go in a fire, tornado, or other emergency? Getting off to a good start is critical to success throughout the course! Last week, I saw Alexander Lacey's mixed lion and tiger act for the first time. Wow. I've seen a lot of really good lion acts and I can say this is one of my favorites. One of the things that struck me about Lacey's act was that one of the most impressive behaviors--a series of cat-over-cat leaps around the arena--took two tries. When they tried it the first time, it fell apart almost from the start. I thought, wow, that one didn't work and sort of expected him to just move on to the next thing. Circus acts are often timed so tightly in the program that taking a lot of extra time can really throw things off for the rest of the show. But Lacey did NOT just go to the next thing. He put the cats back on their seats, called them down again, and then started them on the same trick. And wow, did it pop the second time. Over and over and over again the cats leapfrogged each other. I could hear folks saying, "look at that that!" to their parents . . . or their kids. I thought to myself at the time, "good choice!" in starting over. For selfish reasons, I'm glad I got to see it done right. But I also realized that if he didn't make them do it again, the cats may get the idea that they only have to do it when they felt like it. And eventually, they may never really want to bother with such an energetic trick. You know how cats are . . . especially when they realize that you're going to love them and feed them and rub their ears no matter what. One CAN let it go, then later have a practice session in which it gets repeated over and over and over until nobody thinks it's okay to just skip it. But it works much better if you have a do-over each and every time it doesn't work. Likewise, in classroom teaching, a series of do-overs is just about the only way to eventually achieve mastery. Remember my previous post Practice, practice, practice? Sometimes it is inconvenient, even frustrating, to stop the flow of things and work on something that you thought your students had already mastered. One COULD just let it go. Perhaps make a note to practice that part again some other time. But it's much more effective if you just stop at that moment and correct it. And maybe, just maybe, all it takes is that second try. Not a whole afternoon on some other day. And maybe, just maybe, this'll be the time they finally "get it" and it's a finished and polished "part of the act." Want to see Lacey's act? Check out this video. You won't find the wonderful leapfrog trick in the video. The video was published just a few months ago, so I'm thinking that the leaping trick is new to the act. So I guess it'll be a while before mastery is acheived, eh? If you've ever seen a lion act, you may not have noticed the men and women in nondescript coveralls along the edges of the ring (sometimes even inside the cage). You're not supposed to notice them, so don't feel bad if you didn't. The spotlight is supposed to be on the lion tamer and the lions . . . not the rest of the lion taming team. Anybody in the entertainment industry knows that the term "solo performer" does not mean that only one person is involved in presenting what you are seeing and hearing. This is absolutely true in lion taming as well. One person may take the spotlight, but a coordinated team effort is required to successfully train and present a lion or tiger act. During training, assistants inside and outside the practice arena are needed to supply treats (usually bits of fresh meat), position props, and move animals into and out of the arena. These assistants usually help guide each animal during training and practice, meaning that more than one person is actually training the animals. Sometimes an assistant guides one animal and the lion tamer another animal as they learn a behavior that requires two animals acting at the same time. During a performance, sometimes it's the assistant helping to cue a particular animal to leave its seat and move to the middle of the arena, to enter or exit the arena, or stay put on their seat during another animal's time in the center. 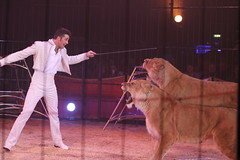 The assistants keep watch on the seated animals so that the lion tamer can focus on the animal(s) performing at the moment. Often, it's the assistants to rush to help diffuse a dangerous situation if it arises. The best lion tamers are those who know that they alone cannot pull it off. They are the lion tamers who spend extra time and energy building a team that can effectively work together. Likewise, the best teachers are those who know how to use the team approach successfully. I've known teachers who do not respect other professionals involved in the learning process and fail to involve them in the learning process effectively. Which often adversely affects the quality of learning in their courses. For example, do we go out of our way to include library professionals, safety officers, maintenance and housekeeping staff, learning specialists, accessibility teams, and others in our planning and execution of our teaching? If we don't develop the habit of including ideas from--and enlisting active cooperation from--our teaching team, then we run the risk of being "eaten alive" when things don't go as planned. Here are a few ideas to get started in team thinking. Library professionals are often eager to assist in researching content updates and new teaching approaches. They're often willing to walk our students through the "how-to" methods of doing research for their class projects. I've had librarians help me keep an eye out for new books and new articles that I'm likely to find interesting or useful. Safety officers can help us plan some strategies in dealing with aggressive students or other potential hazards. Developing a good relationship with your safety team makes all of you more comfortable and confident as you "perform" your daily work. Maintenance and housekeeping staff, when made part of your team, are often willing to assist you in keeping your classroom spaces "just the way you like them" to facilitate teaching and learning. They often have some great ideas for making your space even better! By having a working relationship with them, you are more likely to get the help you need--and get it right away--when things go wrong. Learning specialists and accessibility staff often have some useful tips and shortcuts, especially when dealing with challenging students and challenging groups. Like circus-goers, we often let those team members in "nondescript coveralls" become invisible to us. But it's better to be more like the lion tamer to relies heavily on their help to succeed. I'll never forget the time that a tiger's claw caught the tendons in my wrist and pulled me to the ground. I was training a tiger to find his seat and stay there . . . one of the first behaviors any circus cat learns. I asked him to get on his seat (which he was doing well) and then walking him around the outer edge of the practice arena before asking him to again go to his seat. Each time he did as he was asked, he got a bit of fresh meat. The meat was held in a bucket outside the arena by my assistant. When I needed more treats, she would pass a handful of meat tidbits through the mesh of the arena. Then she'd wipe the juice from the meat on a towel and stand ready to assist me in other ways. However, that afternoon she carelessly put the towel on the side of the arena, hanging through the mesh, rather than safely outside the arena. As the I walked the tiger around the arena's edge once more, he sniffed the meat on the towel and lunged for it. Before we knew it, the towel was now in the tiger's mouth. It seems that the animal knew he shouldn't swallow the towel. But he wasn't about to give it back to me, either. I know; I asked him several times to give it back to me. I couldn't just leave him there until he got tired of it. First, he'd probably outlast me on that score. Second, the arena was not secure enough to leave him unattended. He needed to be leashed and walked back to his den--impossible without him giving up the towel. So I tried to throw him a treat, then grab the towel as he jumped at the treat. Not surprisingly, he was a lot faster than me and batted my arm away as I grabbed for the towel. Ooops. His claws were out (a reflex when defending his "kill") and one of claws sank into my wrist and hooked around a tendon. Oops. If it were a case of him batting me away for any other reason, his claws would not have been out. But this time, he accidentally got me. I knew that if I pulled away, I'd have some serious damage. So I went with his paw as he pulled it back toward him and tried to retract his claws. Thankfully, the claw retracted and I was left with just a puncture . . . and a perfectly intact tendon. Whew. I got up and away safely. Sure, there was a bit of bleeding and some days of serious infection prevention as the wound healed. All I have to show for it now is a small scar . . . and a story. One of the lessons of that story is that sometimes, it's just a small, seemingly inconsequential, thing that gets in the way of the day's lesson. For me and my assistant, that towel was a small thing that was not distracting in the least . . . to us. For my tiger, that towel was the most distracting thing in the universe. He could not help but go for that unprotected prize. For all he knew, we were trying to get him to jump for it! From that day forward, I always inspected every inch of the practice arena before, during, and after every session. Looking for the little things that could distract a cat and cause a potentially life-threatening problem. There are so many distractions that can exist in a classroom. They may not be distracting to us. At all. But for a variety of reasons that we cannot possibly fathom, there may be something small in the classroom that one or more students simply cannot ignore. Telling them to may not work. For example, I have a college class with three students who sit near the back of the room and chat quietly during class. I usually cannot hear them. When I do, I automatically tune them out and focus on the day's lesson. However, some (not all) of my students simply cannot focus while the quiet chatter is going on. And if they cannot focus, they cannot learn. So, like a lion tamer, we teachers need to carefully manage the distractions in our learning environments. For example, I need to pay more attention to the back-of-the-room chatter and do what I can to stop it. We need to consider that even though many students should be able to redirect their focus, sometimes they struggle . . . or they simply follow their instincts before they realize they've drifted away. What if there are little (or big) distractions you cannot manage? I'll tackle that one in an upcoming post! I was recently thinking about the timing of learning sessions. What got me to thinking about this was a recent article in Science News citing research in animals that supports the idea that staggered lessons may work better than lessons that are timed at regular intervals. When training lions and tigers and many other wild animals, I recall that I got the best results when I used a training schedule that included frequent but rather random short sessions. I didn't have any particular scientific basis for doing that . . . it just seemed more natural to me. More like how we learn things from our environment in "real life." Now scientists are seeing that perhaps there is something to this idea. I know that with my 8-year-old, if I ask him to spell one of his spelling words for the week occasionally throughout the day, every day, he remembers them much better. Not just on his weekly spelling test, but for a longer term. I tell my college anatomy students to study their flash cards in random, short intervals throughout the day, too. Those that do this find that it's a very effective way to learn a lot of facts very quickly . . . and retain them in long-term memory. My high school rotated classes over an 8-day cycle. I like the fact that math class was not always after lunch! And sometimes I could start the day with biology . . . a great way to start any day! Years later, when I returned to the same school to teach I loved this schedule at least as much as when I was a student there. Maybe moving classes around this way is not only fun, but effective. Teachers, do you any of you have experiences in which staggering lessons seems to have helped your students? If so, please share them! During training sessions, lion tamers are primarily concerned with developing new behaviors or refining existing behaviors. Likewise, in each class session teachers are primarily concerned with moving on to new concepts. 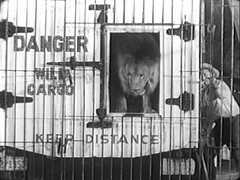 Lion tamers rarely just "get to it." They instead take a moment to connect with each animal in the training session. They literally talk to them and give them a pat or rub. Lions LOVE rubs! This engages the animal in a way that helps them focus on the trainer and on the training environment. It also sets a positive, engaging mood in which to begin the "real work" of the session. Then a lion tamer will ask each animal to repeat a behavior they have recently learned. Or perhaps an older behavior that relates somehow to the new behavior that will be the focus of that training session. This gives the animal a sense of success and accomplishment. Of course, it also brings to their consciousness the whole idea of performing and following directions. If it's a behavior that relates to the day's lesson, then there's an added benefit . . . it gives them some practice in movements that they'll shortly be asked to do. Beginning with a positive introduction and a quick review of previous learning is also a useful strategy in the classroom. Engaging your students in some friendly banter before the class starts is a smooth way to get their attention focused on you and the learning environment. And it sure beats an off-putting shout to "sit down and shut up!" I can't stress this "engagement" concept enough. It enhances classroom discipline and, more importantly, enhances student learning. Unless and until you can engage your learners, you're going to have a tough time! A quick review doesn't have to take long. It could take many forms. In my anatomy and physiology lectures, I usually start by summarizing the main points of the previous class session. I may have some extra words about a concept that serves as the foundation for the new topic about to be addressed. I may even pose a clicker question on a review topic, just to get everyone back in the groove of that previous topic. By connecting yourself to your students and recalling a previous topic or two at the beginning of each class, you'll find that your classes work better and that student learning improves! A few months ago I saw Jane Fonda on The Tonight Show and when Jay Leno chided her that maybe she was losing her faculties because of aging, she quipped "I may be losing my eyesight but I am gaining insight." Of course, she's right. Neuroscientists continue to demonstrate that our brains do indeed become much more capable of insight, wisdom, and problem solving as we age. This train of thought got me thinking about old lion tamers. Really, I swear to it! Sometimes people ask me who the best lion tamer is or was. Although in my mind there are several close contenders, my immediate response is always Jules Jacot . 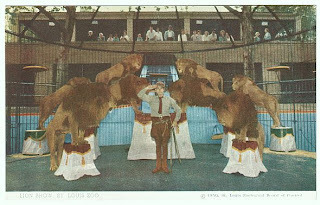 Jules was the elderly lion tamer at the St. Louis Zoo when I was growing up. He was the first lion tamer that I ever saw perform and even now, looking back through the lens of an experienced lion taming enthusiast, certainly the best. Whenever other animal trainers find out that I grew up in St. Louis, they asked me if I knew Jules Jacot. 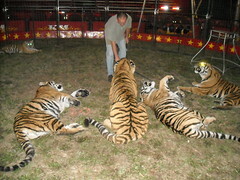 Although he never became famous to the public, he was very well known and respected among circus people and zoo people. 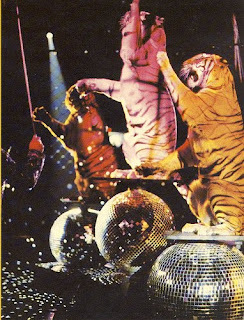 When I first began working with big cats, I noticed that most of the new acts were being put together by elderly lion tamers, most of whom did not perform in public anymore. Jules Jacot had just put together a new act shortly before he died (in his sleep) at age 81. At first I wondered why it was the older trainers, rather than the younger and presumably more energetic trainers, that were being hired for these challenging jobs training new groups of lions and tigers. It's one thing to present an existing act but quite another to quickly put a new act together with young, untrained wild animals. Eventually, I came to realize that the older trainers were so good at training cats that they could put a really good act together in a much shorter time than a younger trainer could. Of course! These older men and women had experimented over a lifetime and their experience allowed them to apply their distilled wisdom to each new training assignment. I soon learned that if I wanted to become a successful wild animal trainer, I needed to seek out the wisdom of these experienced trainers. A few of them have written books that contain the fruit of their experience. I read and reread as many of these books as I could. I sought older trainers and asked them to tell me stories about how they do what they do. When they offered to let me watch them train and practice and perform, I jumped at the chance! It was amazing to me how quickly each of them could read their animals and use that information to train them quickly, efficiently, and with very little stress to the animal or the trainer. I think this is a good lesson for us as educators. Teachers who have spent a lifetime experimenting with different approaches and techniques, teachers who have seen hundreds or even thousands of unique students over their careers, can be a wealth of information and insight for beginning teachers. For all of us. In my modest experience, I have seen some new teachers quickly blossom into effective teachers and others not fare quite so well. And most often, the difference is whether they invested time and effort into reading and watching the "old masters" at work. No matter where we are in our teaching careers, I think we can benefit from sitting in on a class or two taught by an experienced colleague. One of the many things that most folks just don't get about lion taming is that you have to try to think like a lion. To have any chance of success, a lion tamer has to get over that ingrained human habit of assuming that animals think like we do. Many of you reading this have done that, right? You think that your dog sees the world the way you do, supposing that she recognizes you by your face, when really it's your smell and your voice. You think that poor lion sleeping in a circus wagon is bored and miserable, when in fact he feels secure in having a snug, safe place to sleep. You think that your cat loves you and missed you while you were gone when she rubs up against you, when she's just scent-marking you with her facial glands. Most of us cannot fully appreciate that animals perceive the world differently. We cannot fathom that they process thoughts differently and have different motivations, fears, and desires than humans. That's why there aren't a lot of lion tamers in the world. OK, that and the basic human fear of being eaten by lion. It also explains why there are good animal trainers and not-so-good animal trainers. The good animal trainers really get it . . . and make use of that insight. I think Temple Grandin really nailed this point squarely in her book Animals in Translation: Using the Mysteries of Autism to Decode Animal Behavior . In it, she relates that each animal's view of the world is far different from what we humans imagine. She feels, and I agree, that her altered perceptions of the world as an animal expert with autism helps her to see the practical importance of seeing such differences. What is insignificant to us can be huge to a particular species, or a particular animal, and vice versa. When working with big cats, I remember learning that it's a snap to get most tigers to sit up and even stand up on their hind legs--but not so easy with lions. Why is that? I can't say for sure, but I'm pretty sure that it's because in nature tigers just naturally sit up and stand up when playing or sparring with each other. But lions rarely do. Besides, the structure of a lion's tail just doesn't lend itself to sitting up as easily as a tiger's on a flat surface (like the ground or a pedestal). You can get a lion to sit up easily only if they don't have to bend the base of their tail much (see the photo). If you don't take these things into account, you're going to be frustrated with those "stupid" lions that can't learn sit-ups as easily as those "brighter" tigers that can. When it's not about smarts at all. As a teacher, I wonder how many times I make this kind of mistake with my students and how I teach them. One mistake I know I've made is that I used to assume that my students have all the study and learning skills that I do . . . or that I did when I was a student at their level. It never occurred to me that I had somewhat advanced academic skills and very solid educational background. Yikes, those are not valid assumptions for all my students! I cannot assume that my students have the same skills and strategies for taking notes, or for reading a complicated text, or for memorizing facts, or for drawing inferences from those facts. Or that they even have similar personal and cultural experiences as their context. Once I realized that, I found ways to provide a variety of resources that can help fill in the unique gaps in each of my diverse array of students. And what a difference it has made in the success of my students! Beyond that, I also realized that not all students experience the world the way I do. I've not had some of the varied and sometimes traumatic experiences they have had. I don't have all the same physical and perceptual limitations as do my students. Some of these differences are profound. But most are extremely subtle. Subtle enough that they're easy to miss. And easy to dismiss. I've found that when I have the lion tamer's approach of looking for and examining the unique perspectives and limitations of different groups of learners and of individual learners, I can more easily help them succeed in learning. Good lion tamers take time to learn about the characteristics of species and take time learning about the characteristics of individual animals. They learn to see and think like a lion. They find that it helps them quickly find success in teaching their animals. Mediocre lion tamers think all animals should be able to do certain trained behaviors and should all be able to learn them the same way and at the same speed. And are puzzled over why they don't have consistent success with their animals. And sometimes experience frustrating or tragic results. Great teachers are those that consistently help their students succeed by learning what works and what doesn't for different learners. They realize that their students don't necessarily think like they do. The great teachers try to think like their students to see where the challenges and fears are, so they can be overcome. The great teaches realize that "one size fits all" simply isn't possible when dealing with a diversity of learners. In a previous post I ranted about the necessity of practice, practice, practice. I'd like to follow up with another example of how repeated practice can be facilitated in an active and engaging way in the classroom. One of the most engaging ways to facilitate active, fun practice in the classroom involves the use of student response systems (clickers). I've written about my use of clickers in my other blog The Electronic Professor. Although the first generation of such systems were difficult to use, the current systems are as easy as pie and extremely reliable. In my anatomy and physiology courses, which are rigorous courses that serve as a foundation for all of the health-related careers, I have found clickers to be a wonderful tool for practicing problem-solving. My online tests and in-class exams are chock-full of case studies and other applications that require the ability to analyze situations, apply concepts, and solve problems. As you can imagine, students struggle with these items. At least at first. When I introduce an example of one of the trickier problems that students will encounter on a test as an in-class clicker question, it allows them to practice solving it is a group. And with me there to help. Often, the graph showing how students have answered the item tells me that most, if not all, of them have failed to answer it correctly. That's because I try to choose the type of question that I know from past experience students give my students trouble. So when the results of the clicker poll are revealed, I can tell them that they've missed the mark and then ask them to try and figure out what went wrong. With some leading questions, I can usually coax the correct response out of them. I usually only after some discussion and some group practice in analyzing the situation and applying concepts effectively. This way, they get a chance to make a mistake without penalty and completely anonymously. And they get a chance to collaborate on fixing the mistake. In doing so, they are practicing the skills needed to solve such problems. And they are reviewing the concepts needed to apply to the problem situation. My coaching helps them learn where to start in solving a problem and what steps to take to get to a solution. In a brief supplement course that accompanies my anatomy and physiology courses, we use the clickers to do another kind of practice. This one is more like a traditional drill. But not quite the boring rote learning of days gone by. One of the things that my students really struggle with is how to identify anatomical structures in dissected specimens, models, and charts. They know that they will be tested in a so-called "practical" exam. That is, they will be given a specimen and asked to identify which structure is which. In other words, they have to be certain that they have found the right structures, they have to memorize a large number of these structures' locations and characteristics, and they have to be able to apply this knowledge at a moments notice in the presence of the lab instructor. Not having had much if any experience with this type of learning and testing, and being faced with an overwhelming number of such concepts to learn and apply, they struggle. So what I do in my supplement class is let them practice on paper first. That is, they do "virtual" dissections of photographs. Then they go to their lab course and do the actual dissections. After that, they come back to the supplement course where I give them examples of what they will see on their practical exam. But instead of answering individually, they use the clickers to answer all at once. And anonymously. I reveal the graph of results from the clicker poll and we see how many people were successful in correctly identifying a particular structure. If most people in the class were successful, then I either move on to the next item or a briefly remind them of the identifying characteristics of the structure to reinforce what they at least tentatively already knew. If a significant number of students were unsuccessful, then I can ask some pointed questions that will lead toward the correct response. This allows me to give them some additional tips on how to locate and identify structures. Such tips would likely fall on deaf ears at the beginning of the lesson. Learning such tips immediately after failing to identify a particular anatomical structure shows the student hi useful they really are. I usually set up these drills in a sort of game show format with the timer and buzzer so that the students have to respond immediately, as they would during the practical exam. And like a game show, they seem to really get into it and cheer when they nail it (or groan when they miss it). Because the system allows them to remain anonymous, they are not afraid to make a stab at each answer. They can make their mistakes during our drill and not in a practical exam. By having a large number of such items, many of which show up in more than one drill, they get in a lot of practice, practice, practice. Do you have some other ideas for effective practice of course concepts and skills? If so, I'd love to hear about them! I've been teaching a brief course that supplements my regular anatomy and physiology course. I use this supplement to help my students learn tips, tricks, and shortcuts to learning the concepts of what is typically a very rigorous foundation course. And our mantra in the course is . . . yes, you guessed it . . . practice, practice, practice. I only just realized where I picked this up! It had been ingrained into my psyche as a young apprentice wild animal trainer. One of my early mentors in wild animal training is an earnest student of the art of presenting animal acts in the circus. During his frequent monologues about what makes the most successful big cat trainers so successful he kept coming back to one central theme: practice, practice, practice. When I'd bring up how fantastic this or that trainer's act was, he'd nearly always respond with, "yep, you can tell he (or she) practices a lot." Conversely, when I'd have a comment about an act being sloppy or boring or "falling apart" during a show, the response invariably included, "well that guy (or gal) never practices." I guess this strikes the casual observer as a truism: practice makes perfect. Duh-uh . . . doesn't everybody already know that?! But in real life . . . apparently not. Or maybe everybody knows it but not everybody lives it. There were (and are) a lot of wild animals trainers who really don't practice . . . or at least not very much. And their acts were pretty unremarkable (unless they were remarkably awful). The truly great big cat trainers are those who practice frequently. And, of course, their acts are polished and exciting and, well, often breathtaking. It strikes me that so many teachers, and so many learners, have forgotten the central role of practice. Perhaps as educators, we are turned off by the "old fashioned" notion of drills and rote learning. And perhaps as learners, we are turned off by the idea of practice, especially repeated practice, as boring, boring, boring. I can certainly empathize with those feelings. As a teacher, I want my lessons to be active and engaging . . . not boring and unimaginative. I want the learning done in my courses to become part of my students' long-term memory and integral to their ongoing ability to apply what they know and to solve problems creatively. And, alas, haven't we been told time and again that practice, practice, practice is passé? However, my experience tells me that I can do both. My successful outcomes for learning in my courses tells me that I can facilitate repeated practice while at the same time having my students engage in active learning. I think we need to be like the more successful lion tamers who know how to facilitate practice successfully. Rather than making rote learning the beginning and end of our teaching strategy, which I contend is truly old-fashioned, we can use active learning methods to promote repeated engagement with the concepts of the course. For example, I no longer give frequent in-class tests and quizzes.I instead have my students engage in in-depth online tests. Because I use huge test banks with randomized question sets, they can attempt each test multiple times without getting the same set of questions. Because they want a good grade, and perhaps even because they really do want to learn the concepts, most of my students take all the attempts that they're allowed. Although these tests do contain some strictly factual questions, most of the items require higher-order thinking skills. And many items require some additional research beyond what is immediately apparent in their class notes and in the textbook. These items ask students to apply concepts, to evaluate situations, and to dig deeply into the significance of each subtopic. They are tested on both details and "the big picture." By time they are ready to take my in class exams, they have had an extraordinary amount of practice in grappling with both the straightforward and the not-so-straightforward concepts and applications of the topics covered. This is not rote learning. But it does involve a lot of practice, practice, practice. And what is really great about this approach is that, although the students fully realize that they are spending a lot of time and are working very hard, they do not have the feeling of drudgery. They are fully engaged trying to solve problems, reveal the mysteries of a case study, and answer tricky questions. This is just one of many examples of how repeated practice can be active and engaging. I'd love to hear your comments on ways you found to facilitate repeated practice without it being a dreaded, boring activity. Don't back a lion into a corner! 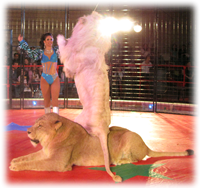 In my last post, I explained how lion tamers use chairs to "bounce a lion" and coaxing reactions that will challenge them to move around in different directions in the arena. I used this process as a metaphor for how good teachers can coax their students to accept challenges in solving problems and learning new skills. Today, I'd like to apply the metaphor of the lion tamer's chair in a different way, by applying it to classroom behavior and discipline. Before I jump into things, I want to clarify what I mean when I use the term "classroom." I mean any learning environment in which teachers interact with students. That could be in a traditional classroom, or in a lab, or on a field trip, or in an online environment, or . . . well . . . anywhere you can imagine. As I've stated, the lion tamer's chair is merely a tool that helps coax a lion to move in a particular direction under the direction of the trainer. Its use requires knowledge of the natural behavior of lions and skill in using that knowledge to manage the behavior of the lions to achieve desired outcomes. Likewise, knowing something about human behavior allows teachers to develop skills in managing the behavior of people in the classroom environment. Applying the chair metaphor, we as teachers can develop skills in stepping through boundaries in ways that promote good classroom discipline and thus enhance the learning environment. 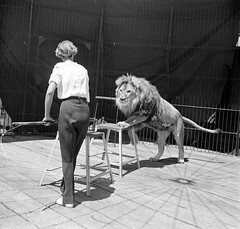 Recall from my previous post that the lion tamer's chair is used to enter the "personal space" of a lion to different degrees, each of which elicits different reactions. Enter the outer boundary and the lion backs away. Move past the inner boundary and the cat gets irritated and moves toward us . . . menacingly. As you can imagine, different lions have different boundaries. Some lions let you get fairly close before they back away, whereas others back away before you can get close to them. Lion tamers learn this by interacting cautiously with each lion until they know the boundaries well. Teachers can also take time to learn the boundaries of their students. Different students have different personalities and experiences that mold their boundaries, just as lions do. If we learn some of these boundaries we can more efficiently learn how to apply that knowledge to managing classroom discipline. For example, some students are very sensitive to the "push" of a teacher who appropriately challenges a class. When a student who feels threatened, we have crossed a boundary with them. They may lash out at us, even if only in subtle ways, just as a lion does when it is "bounced." If we push harder, then it's likely that we will cross another boundary and the situation will escalate into something very negative . . . and perhaps even dangerous. But if we step back just a bit . . . just outside that boundary we crossed . . . the student will feel less threatened and can be approached again from a different angle. Lion tamers often puzzle over how best to approach a particular lion. Some lions can be quite enigmatic in their boundaries and reactions. But nearly always, sometimes after some failed experiments and consultation with other trainers, a good lion tamer can figure out a way to work with any lion. Disruptive lions can be dangerous in the arena, just as disruptive students can. Not only physically dangerous, but also a threat to the learning process for everyone in the classroom. But if we take the time and effort to learn the boundaries of our students, and their reactions to our crossing those boundaries, then we can tailor our behavior to avoid conflict and instead challenge students in positive ways. 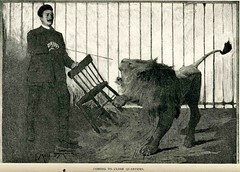 A classic image of a lion tamer includes a whip and a chair. 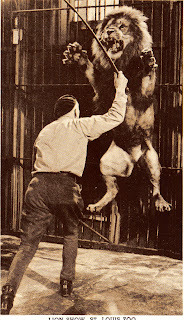 That style of lion taming was popularized in the early 20th century by American trainer Clyde Beatty and others. It is called the "fighting style" because the audience is led to believe that the lions are fresh from the jungle, ready to attack, and the lion tamer must therefore constantly fight back at the ferocious beasts. Of course, this is largely illusion. I say "of course" but many folks still do think that these old lion tamers really were fighting, beating, and subjugating the animals. The illusion was too well done, I guess! Although some of the cats were "fresh from the jungle" in those days, they were definitely not itching for fight. The behavior was induced in the lions for dramatic purposes. Although lions really are dangerous, and a lion tamer does indeed take certain risks by being in there with these big predators, it's largely "for show." Lions, like people, do not like chairs waved in their faces. A trainer who approaches a lion with the legs of a chair extended outward will eventually invade the "personal space" of a lion. Why a chair? It's an easily obtained and carried object that is a good substitute for one's arms. Better a lion take a swipe at a chair than at your arms! A broken chair is easily replaced, eh? When the lion tamer's chair first enters a lion's personal space, the lion will back away. A savvy trainer uses this knowledge to artfully back the lion into whatever position is needed . . . up onto a pedestal, or whatever. However, if the lion tamer makes a sudden move deeper into the lion's personal space, then the lion will defend its space and start to "fight" back. Really, it's a more of a bluff than a full-out attack. It's something lions do with each other all the time. If you've been around house cats that live together you see this behavior frequently . . . but with somewhat less noise and drama than when lions do it. It's all about getting that darn chair out of the way. A lion tamer can use this blustery, irritated reaction to get the lion to move toward the tamer. A skillful trainer can use this interaction . . . which lion tamers call "bouncing" a cat . . . to get the lion to climb onto a nearby ball or cylinder. With enough practice, the lion learns to bluster a bit and quickly move onto the ball and begin rolling it forward. Now we have drama and acrobatic skill being demonstrated. I think this aspect of lion taming is a good metaphor for teaching on several levels. For example, just as lion tamers use their knowledge of lion behavior to induce certain reactions and eventually train complex behaviors, good teachers know what kinds of challenges will induce a "fight" in their students. Not a literal fight, or even a blustery confrontation, but the kind of "push back" that allows the student to rise to a challenge. Let me clarify with an example. Just moments ago, my colleague Jennifer O'Malley told of today's lesson in which her biology students were expected to make some mathematical calculations about genetic probabilities. Because she knows that nonscience majors often get scared by mathematical problems, she chose to "bounce" them through the exercise. She broke the calculations down into steps and then for each step challenged them with, "can you add? sure you can! come on, get through it!" The first "hoop" was jumped through. Then, "can you multiply? sure you can! let's go!" and they jumped through the second hoop. And so she continued with playful challenges as the students easily performed a mathematical calculation that they otherwise might have balked at . . . and perhaps even have stubbornly refused to attempt. But that chair in the face can be an effective stimulus to move forward anyway. How many of us have challenged individual students or whole classes in this way? Or perhaps by continually "getting in their face" to move forward and accomplish a goal that you have set for them? Of course, as in the lion taming metaphor, a classroom teacher needs a certain degree of skill and savvy to do this effectively . . . and to avoid overstepping dangerous boundaries. Happily, such skills are easy to acquire with practice. And when the teacher is willing to experiment and self-analyze the results of the experimentation. Welcome to the Lion Tamers Guide to Teaching! All I really need to know about teaching I learned as a lion tamer. After working as a zookeeper and wild animal trainer for five years at the St. Louis Zoo while I was working on my undergraduate biology degree, I decided to try my hand at taming lions. Why I did that, I'll tell you about later. But I did it. And it was an amazing experience, as you might imagine. And it was nothing like most people think! I'll tell you more about that later, too. After almost a year as an apprentice lion tamer, I decided to leave that profession and enter another profession that I am also passionate about . . . teaching. 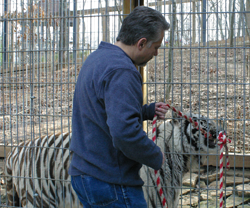 For many years, I continued to work with wild animals part-time and during some summers. Even today, I have a strong interest in wild animal training and consider myself a serious student of the art and science of "lion taming." I'm also a serious student of the art and science of teaching. As a student-practitioner of teaching, I've come to understand that a lot of the principles of good teaching and good lion-taming are very similar, if not the same. Part of being a good student is taking good notes. So I thought I'd start this blog so I can "take notes" on what I've discovered. Mainly it's to help me learn and think about and integrate what I'm learning as I continue in my life as a lion-tamer-turned-teacher. But I hope that some of what I share may get you thinking differently about your own teaching . . . and maybe even help you solve some problems now or in the future. And I also hope this blog will be a forum for other teachers to share what they've learned, too!